This doesn’t always go along with my husband, with whom I hike the most often. So, I sometimes leave him on the trail and hike alone. 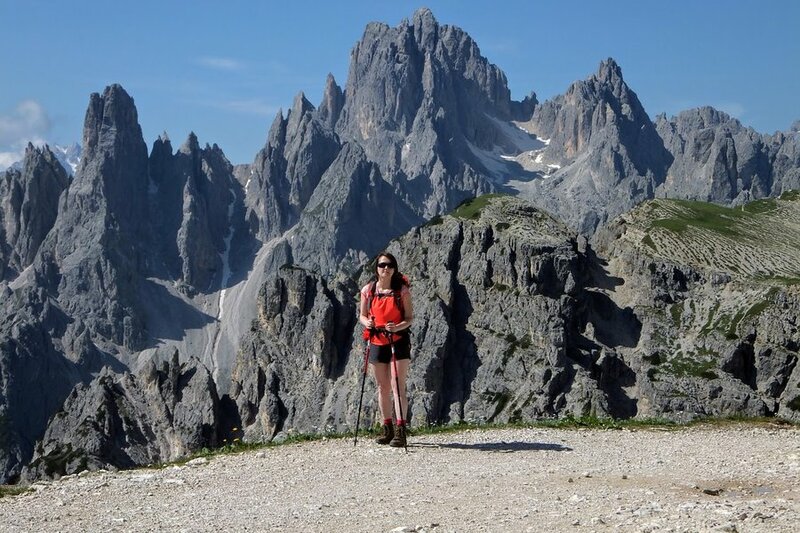 I also did some solo hiking on via ferrata during our Italian honeymoon – Bartosz was recovering from his shoulder dislocation, so I decided I’d explore Dolomites on my own. I've recently hiked solo in Tatra mountains. I returned tired, but more self-confident. I have to admit that I prefer hiking with my husband and friends, but such alone time is very valuable too. However, some people consider solo hiking as risky, or even foolish. I think solitude in the mountains isn’t synonym of threat. I’m not going to write here about winter hikes – those are definitely different and much more difficult than mountain trips in other seasons. What I’m about here are warm months, where there’s no avalanche or freezing cold threat. I see “don’t hike alone!” warnings on mountain websites and forums, I hear it from my family and colleagues. Solo hiking is often considered as a breach of mountain safety code. On the other hand, we admire Marek Kamiński who reached south pole on his own. We look up to Krzysztof Wielicki for his solo climbs on mountains over 8000 metres high (famous winter Lhotse climb). We commend Dean Potter for his first ever solo ascent on breathtaking Fitz Roy in Supercanaleta and Heaven Glacier Point. Why do we cheer famous people on, but when some anonymous person tells about his solo hikes, there will most likely be some defenders of mountain safety code who will criticize his behavior? It seems that ordinary solo hiker is often disapproved of, but well-known name or publicized expedition perfectly justify solitude in the mountains. Truth is, no one seeks death in the mountains. Everyone who goes to the mountains looks for life – in its most condensed version. Safety – this one’s the main factor. When the weather’s not very favorable, or worse - there’s an accident, it’s always better to have a companion. Your mate can give you first aid, call mountain rescue team and support you mentally. Yet, having a hiking partner doesn’t guarantee safety – he may panic and won’t be able to help, phone’s battery may be dead, or mobile network coverage may not be available. Unfortunately, presence of another person with you on the trail doesn’t mean everything will be 100% all right. No confidant – person whom you trust is for some hikers an absolute requirement; for others an agreeable perk. Sometimes we feel strong need to share emotions, complain loudly, or share our enthusiasm. But no, this isn’t possible when you trek alone (you can maybe call someone on the phone, but we all know it’s not the same). Lack of company bothers especially when the weather’s lousy and we’re in a bad mood. Truth is: chatting, laughing and monkeying around may save many trips, or even make one the best in your life. Anxiety – this feeling is especially typical for beginning solo hikers. Uncertainty about skills, distrust for choices – it all adds up to mental discomfort. After a couple of hours every wood squeak and bush rustle makes you want to turn back. I was hesitant and afraid of the unknown as well. At the moment, I can do solo hiking only on signed, official trails. I’m certainly not ready (not sure if I will ever be) for monthly expedition with big backpack only on my own. Fear – this relates to fear of strangers. I like to think that in the mountains there are only fantastic people, passionate about nature and landscapes. And in most cases there are, but even in highly frequented mountains there are crimes happening from time to time. Thefts can happen in the mountain huts and sometimes even on the trails - in our Tatra mountains quite recently there was a stealing incident - a woman was robbed of her camera. Also, in famous Chocholowska valley a woman was raped and murdered! I have to admit that fear of bad people is the worst and it often makes me feel uncomfortable about solo hiking. I’m aware that it’s statistically low risk to be robbed or rapped in the mountains, but you never know. Let’s face it – ladies have a few more threats to deal with. Accommodation – staying in a hotel or guesthouse isn’t a problem for solo hiker, but lonely evening in mountain hut is a different story. Actually, solitude is the biggest in the crowd, when you see all those chatting groups of other people. Not everyone is open/brave enough to join a discussion, especially that not every group is willing to make friends with strangers. It’s much easier when there’s little people in the mountain refuge – it’s easier to make friends with other fellow hikers. Also, big question that remains for me is what to do with money, camera and other valuable stuff when you go to take a shower, but the reception is already closed? Bathrooms in mountain huts are often shared, so taking your belongings with you doesn’t make much sense. If you give a stranger your stuff, he might calculate that running away with it would definitely pay him off. I’ve got no idea what’s the solution here. Pace and breaks – I hike as fast (or slow) as I like – I don’t need to chase my companion, nor do I have to get annoyed when someone’s dragging his feet. I autocratically decide on the number and length of my rests. Independence – no discussions, no compromises, no constraints, no arguments about destination, trail, route. Pure freedom. Photos – I’m not the biggest fan of taking photos. I see great landscape, I shoot it and get back to hiking as soon as possible. On the other hand, Bartosz likes photography, he’s got keen eye for detail, but needs time to choose the settings, set up the tripod, catch the moment… And here I am, making impatient sounds and walking in circles, which I know makes him uncomfortable. But I haven’t found my inner peace yet, I just like hiking so much! Silence – can completely change our perception of mountains and its powerful nature. Laughter, jokes and chatting affect the real mountain atmosphere. It’s not that easy to discover in ourselves full interest of nature when we're engaged in conversation with other people. When we hike with friends, we focus on our companions and the relationships in our group. The landscapes are still amazing but they’re just a background for our trip. Calm – it’s about inner silence which will appear only when we gentle chaos and fears in our head. When solo hiking, we will get a chance to be with ourselves, with our deepest thoughts and emotions, which nowadays isn’t so common. We may come to surprising conclusions, put some things into perspective and distance ourselves from our concerns. Time – somehow time goes slower when I hike alone. I don’t chat, don’t distract myself – the trip becomes longer. New friendships – it’s easier to get to know new people when hiking alone. If we have a companion, we’ll usually be absorbed with him and not that willing to make new friends. Wandering alone makes us wish for contact with the others and we become more open. Responsibility – in group the responsibility is divided between everyone and we often back down thinking “I’ll let someone else decide”. Maybe it’s comfortable, but not very mature. Giving control to someone else is easy, but the final decision may not be suitable for you, it may even annoy you. In fact, compromise usually satisfy no one. When solo hiking, you’ll be responsible for your own choices, which at the beginning is a bit difficult, but with time you gain confidence. That will also positively affect your everyday, non-mountain life. Come prepared – study maps and guides, get all necessary gear, check the weather, let someone know about your trip and chosen trails. Graduate difficulty of routes – start with easy trails or those you already hiked with someone. Gradually increase difficulty and distance. Be responsible – it’s all your decision: the route, whether to continue hiking if the weather’s unfavorable, etc. Be aware of your skills, listen to your intuition. Enjoy the silence – the everyday world which surrounds us is loud, intrusive and very often overwhelming. Solidary trek will do you wonders – you’ll distance yourself from your troubles, listen to yourself and practice mindfulness. At the beginning, such isolation is a bit overpowering, but with time it becomes just fine. What I need to admit is that mountain trips are wonderful, regardless of whether you hike with your friends or alone. I personally prefer hiking in small group – 4 people is enough to have fun (hiking in bigger group usually equals many compromises). However, most often I hike with my husband who, thankfully, shares my passion. Solo hiking surprised me and broadened my horizons. However, I’m aware that not all hikers are keen for lonely escapades. There are people who need constant company of the others. And there are also people for whom there’s nothing better than solo hike. Let everyone decide for themselves. How about you, have you ever tried solo hiking? If so, have you liked it?